With Christmas drawing near, it’s time to think about renewing any books you may have borrowed from us that will be due for return over the festive period. All loans are automatically renewed up to three times unless someone requests the item. If an item is requested by another customer, it must be returned. After three automatic renewals, we will send you a courtesy email to alert you that the items you have borrowed are nearing their due date. Once we send you an overdue notice, you have seven days to either return or renew your loans. You can renew your items by replying to the email notice, telephoning us, visiting the Library with your ID card, or online. This post provides a quick step by step guide of how to renew items online through Library Search. 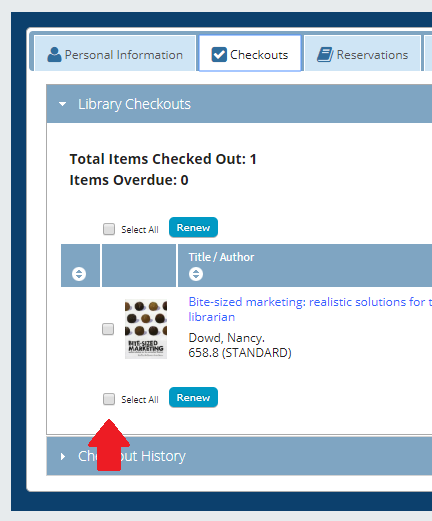 The screenshots relate to the Kings Norton Library profile, but the process is the same whichever Cranfield University library service you use. Go to your Library account. You can either follow the link in the email we send you, or you can click the link at the top right of the Library Search screen. Log in to your account using your usual University network username and password. Go to the “Checkouts” tab. Click the radio buttons to select the items you wish to renew and then click the “Renew” button at the bottom of the tab. If you wish to renew all your items, you can click on the “Select all” option next to the “Renew” button to save time. As long as no-one else has requested the items, they will be renewed for you. Please do not ignore our emails about overdue items. As you can see, it is very quick and easy to renew them and doing so prevents the system from suspending your account.